Carys Staton and Russell Maliphant in Still Current. Photo by Hugo Glendinning. BOTTOM LINE: Although Russell Maliphant was injured for this season at the Joyce Theater, his deeply moving dance solos and duets have the power to transform each of his 5 talented soloists into other worldly beings. Russell Maliphant’s intimate evening consists of two solos and three duets with five dancers total. The dancers are distinct and incredibly talented in contemporary dance, but also have training in various martial arts, popping, boogaloo and ballet. The Joyce Theater stage is cropped by the simple, yet effective boxes of light containing the dancers in almost every piece that specifically focuses our attention, not on the space, but on movement and it’s kinetic nature. The lighting by Michael Hulls is often very dim and we don’t see emotion in the face, but pure visceral movement. We don’t relate to the dancer as a person, but to the feeling that the dancer evokes physically. The music completes this perfect trifecta with minimal but powerful music by Andy Cowton. The first work captured its title. Critical Mass is the smallest amount of momentum to create growth and this duet is like a haiku. It’s a study of minimalism at its best. 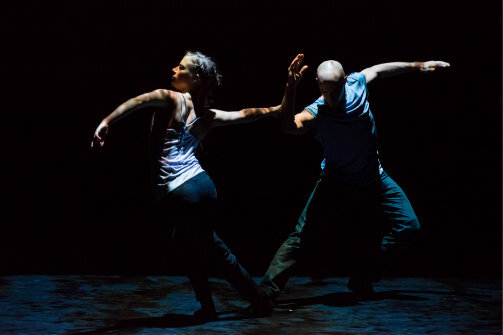 Two dancers framed by the lighting, Thomasin Gulgec and Dickson Mbi, complete each other as molecules. Their masculinity comes not just from flexing their insanely strong muscles, but their reaction time to each other and those martial arts reflexes that use timing and an almost relaxed state to provide strength. At first, it seems as if there are only about ten phrases of movement the entire time, but the order and velocity at which the dancers enter and exit them are completely satisfying and exciting in an unexpected way. It’s the feeling you get when you know you are watching a happy ending to a movie and it’s comforting. Two, danced by Carys Staton, begins and ends in a small 5-by-5 square of dim lighting creating a chiaroscuro effect. There is a brighter box of light around her as the dance progresses. Her limbs glide and click in and out of that brighter light and it turns her limbs into shooting stars in the space. Staton, a sinewy and velvety armed creature whose razor sharp precision and gentle fluidity seem to be an oxymoron performs this role once danced by famous dancer Sylvie Guillem. It seems as though this work was made for her on seeing it. Normally when we watch dance, we decide where we want to look and choose the lines pleasing to us. In Still, the projections by Jan Urbanowski dictate what is visible and the dancer's lines seem to disappear before you have fully savored them. There is a strobe like effect that pushes the eye to see more details on the body even when Dickson Mbi is barely moving. The vacillating projections look like ever changing slatted window blinds and we feel as if we are barging in on a private moment. Mbi’s solo pushes his completely unique style of moving, a sum of his popping, boogaloo and modern technique, into the forefront. At times, he bursts aggressively almost out of his body and then retreats like an animal all the while feeling his soulful gestures. Staton later join Mbi and they meld into the swirl of projections as if they, along with the lighting, are creating a great tango of the senses. Another solo, Afterlight, danced by Gulgec is like watching a lonesome angel in a snowglobe transcend the glass round him. He floats and spins from the ground into the air effortlessly and it seems that gravity does not exist for him. He spins on his knees and then into a jump with a puzzling ease. The electrifying and sensitive duet with Staton that Maliphant is famous for dancing is Still Current, performed by Marlon Dino, a statuesque man. Dino and Staton transition in and out and of embraces as the lights fade in and out, again dictating what we should be seeing. This dance explores relationships without being indulgent. The dancers twist and pull away only to get closer and in a moment end up in their own pools of light, separate but equal. At moments, it feels like the light is containing them and like life our surroundings dictate a lot of who we are. Other times, the dancers seem to push the boundaries of the light past them with their sweeping lifts and carefree phrasing. Maliphant’s perspective on movement is pointed and pragmatic. It is like watching a kinetic sculpture being formed in front of your eyes. It makes the most of the subtle details and each of the dancers' artistry enables them to share with us most generously the scope of his work. Every element of Maliphant’s work is thoughtfully put together and his perfect trifecta of choreography, music and lighting showcases that less really is more.